I bought these two amazing products yesterday and couldn't resist myself from playing with them. Of course, Guerlain's Turandot Palette is not new in the market. It was launched with Guerlain's Holiday 2012 collection, which I bought only yesterday. Another, product is lip mix from MAC Pro Range, Crimson, which is a permanent product. Step 5: Apply the irredescent gold eye shadow on the left side of the palette in the inner third of the palette. The gold is not popping here in the picture, but in real life it looks extremely beautiful. 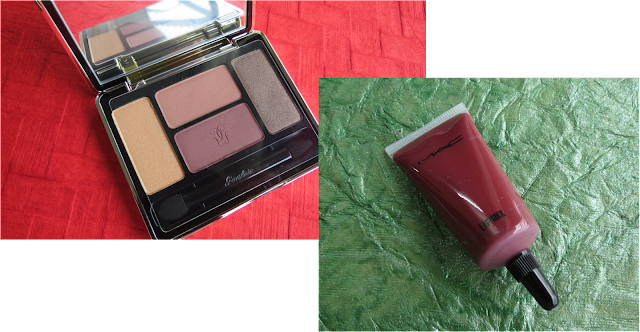 Step 6: Blend everything using MAC Soft Brown eye shadow (I used it very lightly). Apply the shimmer dark brown shade under the lower lash line and on upper lash line using the pointer side of the applicator that came with the palette. Also, apply the gold eye shadow from the palette in the inner third of lower lash line. Step 7: Finished the look by apply the same dark brown pencil in the lower water line, a black eye pencil in upper water line and Maybelline Falsies Mascara. I generally do my brows last, after completing the whole face. At this time highlighted the brow arch using MAC Vanilla eye shadow and also dusted some in the tear duct. I will share the review of both these products, the palette (with few more looks) and lipmix very soon (already liking it very much). Hope you liked the look. how do you find palette ? Thank you Rashmi. I liked the palette so far. An easy glamorous evening look!